Fyrehaar: “What if Heath Ledger was reborn as an assassin the 18th century?? Fyrehaar: is this Connor’s son? Fyrehaar: or another line of descent? I finally cracked open the PS3 I got for Black Friday in earnest and had a go at Uncharted: Drake’s Fortune. I did this as much to set the stage for Uncharted 2: Among Thieves as to experience the first game; Uncharted is known as a hit, but Uncharted 2 is known as a PS3 all-time classic and I wanted to go in with the first game under my belt so I’d be able to understand what’s so great about it. Having started UC2, I can say this was absolutely the right thing to do, as the opening of the sequel is entertaining without the backstory, but blackly hilarious once you know what Drake has already been through. 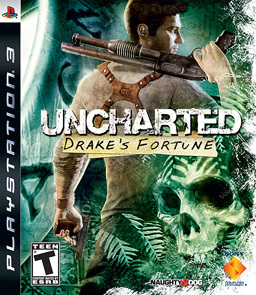 But first, Uncharted: Drake’s Fortune. Sonic Rob: so: Oblivion, or After Earf? Sonic Rob: just because you like Elder Scrolls? Sig Fem Seks: Also, that. Sonic Rob: holy crap, does Will Smith die in the first shot of that trailer? Sonic Rob: man, we are just convinced the world is ending, eh? Sig Fem Seks: I guess so! Sonic Rob: OK, new DLC class: The Trillionaire. Alongside the news that Disney is buying out Lucasfilm from George Lucas/Lucas is buying his way into Disney using his company as collateral, numerous web sites are reporting that the buyout announcement is accompanied by news of Star Wars Episode VII, the pointless continuation of a perfectly-concluded film trilogy that many Star Wars fans have probably already got a homemade script for, and which will be derided by each and every one of those fans for not being true to the franchise due to even minor variations from their ironclad expectations. Sorry to disappoint those fans, but we have the script for the first Disney-produced Star Wars film, and it is… probably not what you are hoping for. It is a time of great upheaval. The destruction of the second DEATH STAR and the death of EMPEROR PALPATINE at the hands of his apprentice DARTH VADER have signaled the end of the evil GALACTIC EMPIRE. The forces of the REBELLION continue to fight pockets of Imperial resistance, but the vast majority of the galaxy is now free from oppression. With freedom, however, comes the opportunity for crime and farcical misbehavior. On the run from his former employers, the HUTTS of Tattooine, Corellian smuggler CAPTAIN JACK SPARROW and his motley crew of miscreants are seeking a treasure that could bring them the greatest prize of all: eternal life.